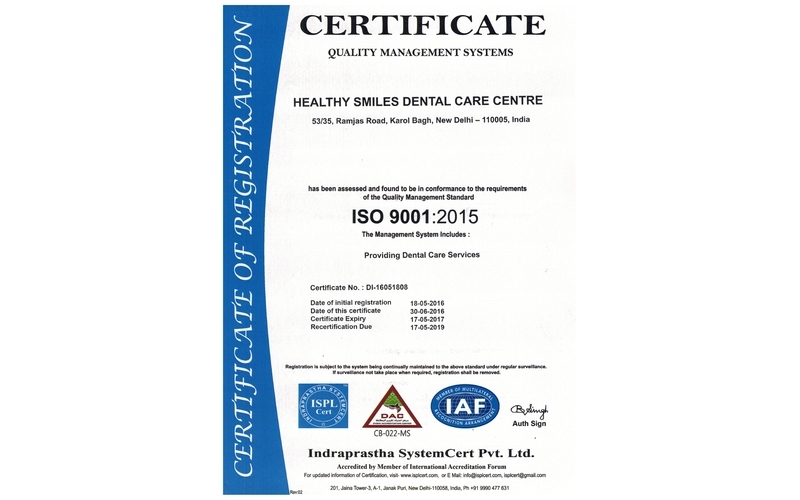 As the leading dental clinic in India, Healthy Smiles Dental Care Centre, is an ISO 9001:2015 accredited — state-of-the-art dental center. Led by expert dental surgeon, Dr. Mala, we specialize in cosmetic dentistry, dental implants, root canal treatment, dentures, veneers, teeth whitening, pediatric (child) dentistry, full mouth dental reconstruction, dental crowns and dental bridges, emphasizing on patients’ natural and beautiful smile. 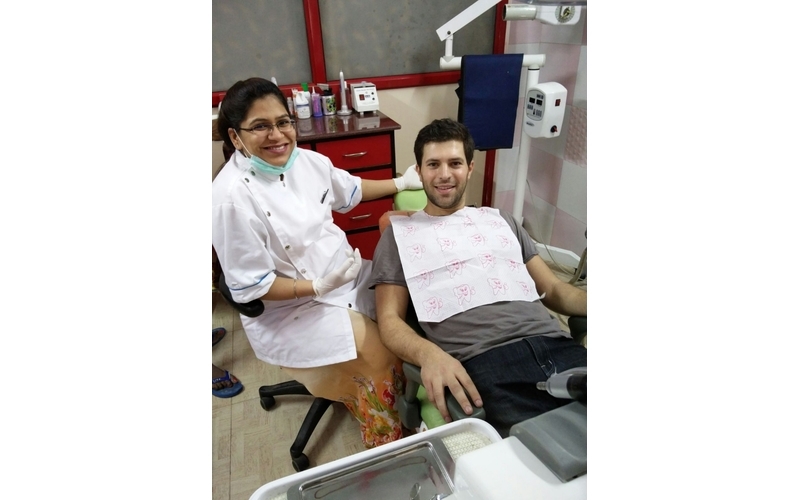 Healthy Smiles Dental Care Centre specializes in the complete organization of dental travel & dental treatment in India for foreign patients and families. 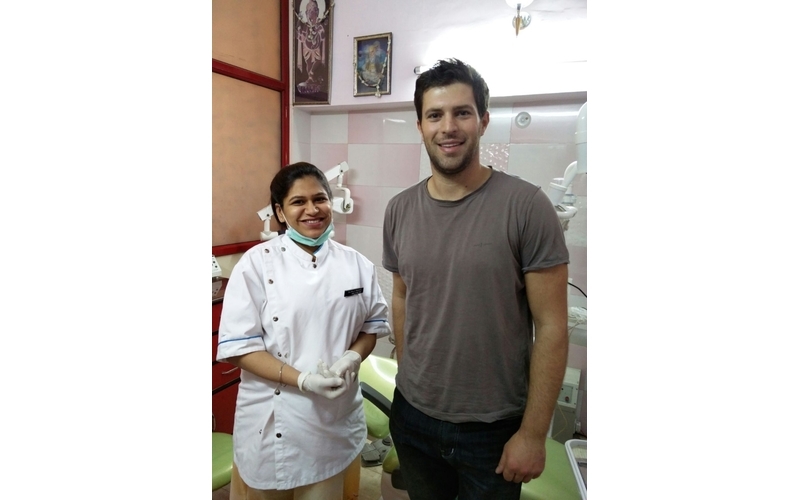 Healthy Smiles provide affordable dental treatment tailored to the needs of each patient, combined with a short holiday in the historic city of Delhi. The service covers all essential aspects of your medical stay in New Delhi — from airport pick-up, accommodation and dental treatment. Upon arriving at the New Delhi International Airport, you will be received at the airport and will be taken to your selected accommodation. Basis your convenience, you will be taken to the clinic for an initial dental check-up, during which your individual treatment plan will be developed. Based in the capital of India – New Delhi, Healthy Smiles Dental Care Centre offer a one-stop dental service for all oral health problems to help you live healthier lives with a healthy smile. Together with their warm and friendly service, highly experienced team and cutting edge clinic, they aim to provide you with the highest standards of dental care in the comfortable surroundings of their clinic. 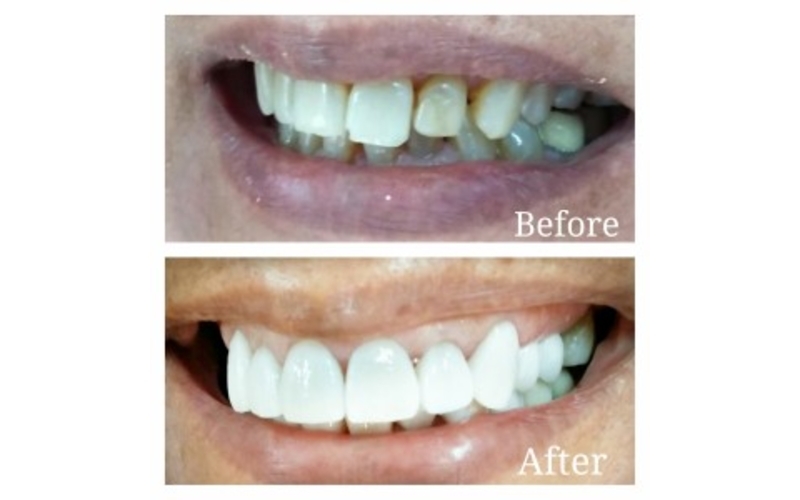 Get a Smile Makeover in just one hour with the revolutionary technology via COMPONEERS. It is a quick, painless and cost effective way to obtain a beautiful celebrity smile without having to pain or undergo any invasive or expensive dental surgery. 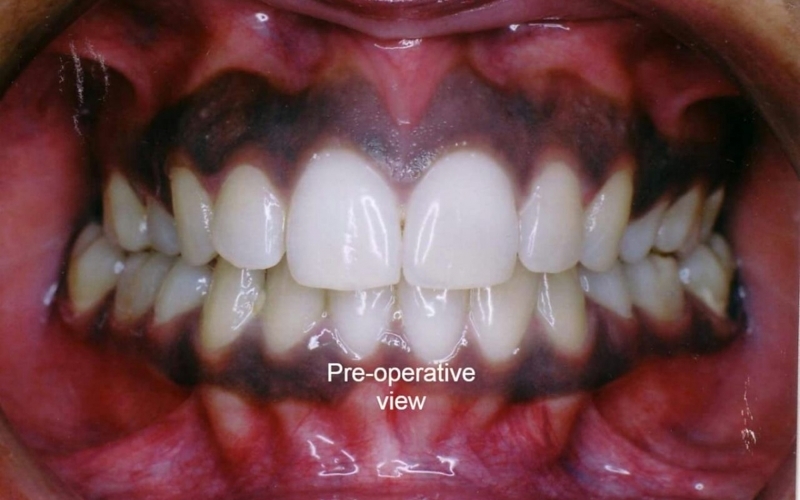 COMPONEER is a new and easy-to-use system for restoring anterior teeth. COMPONEER’s are polymerized, prefabricated nano-hybrid-composite enamel shells that combine the advantages of direct composite restoration with the advantages of prefabricated veneers. 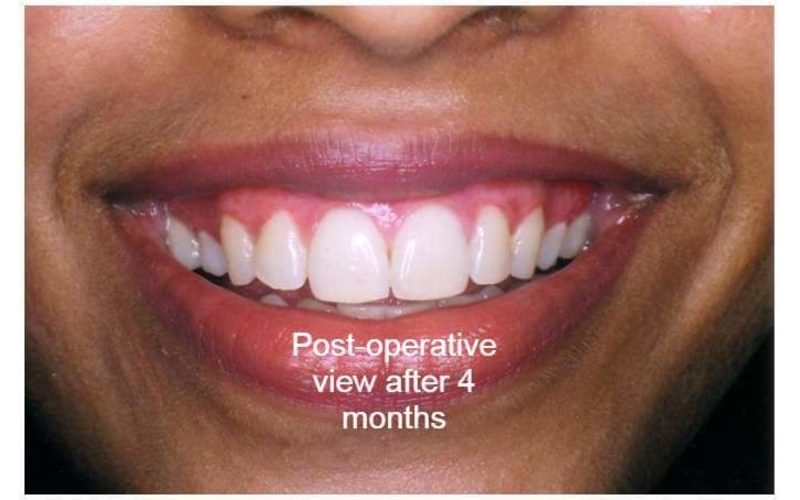 These can be performed efficiently for the restoration of anterior teeth in just ONE SINGLE SESSION of ONE HOUR. Hence, SMILE IN AN HOUR. 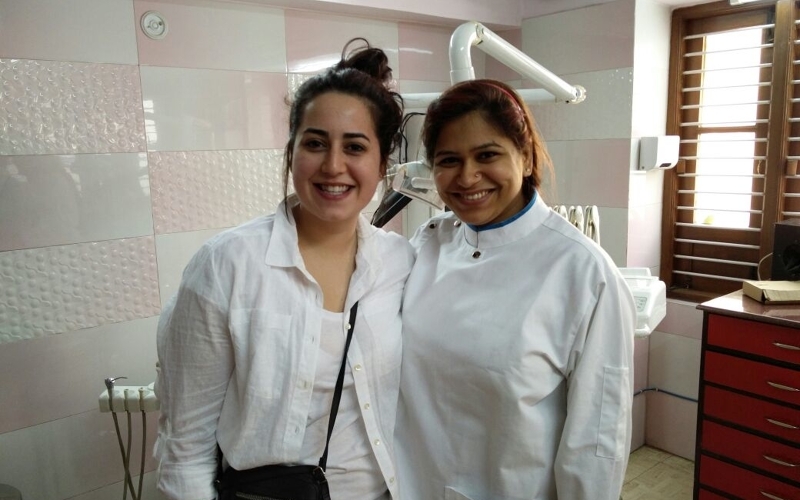 At Healthy Smiles Dental Care Centre in India, we strive to provide our patients with the highest quality of care and help them achieve and maintain optimal oral health and beauty in a safe, efficient and caring environment. 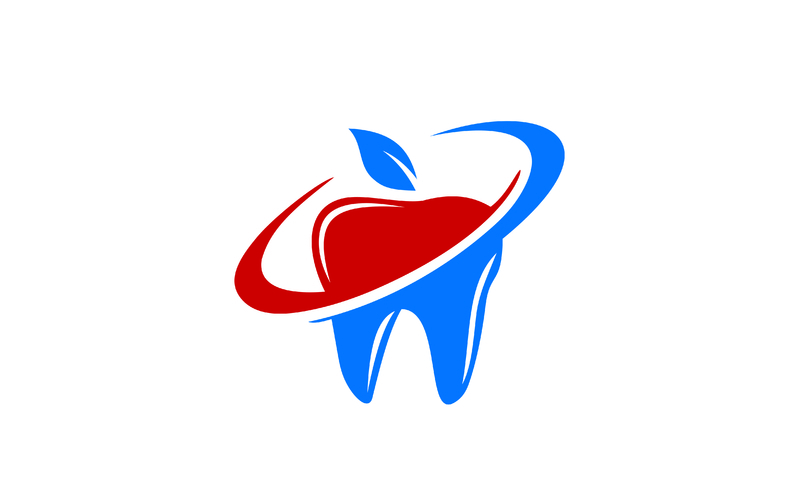 Our mission is to help patients lead a healthier life with a healthy smile. 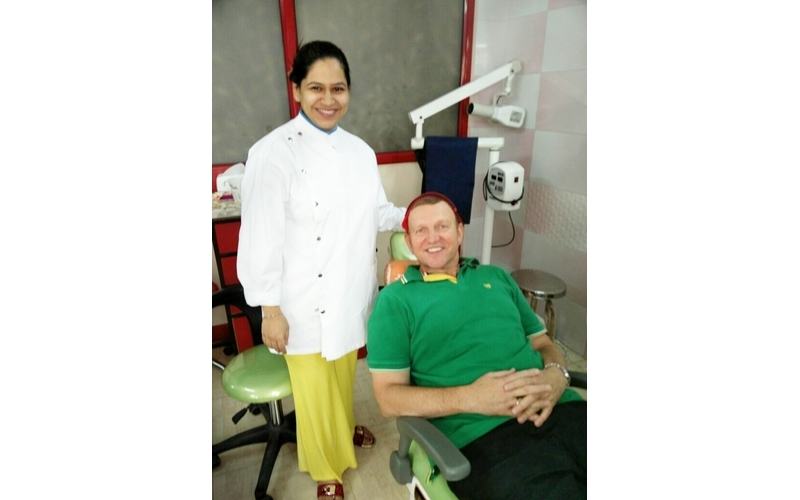 Best Dental Clinic to get Teeth Whitening– I would like to convey my sincere thanks to Dr. Mala for the excellent teeth whitening dental treatment she has performed on me. 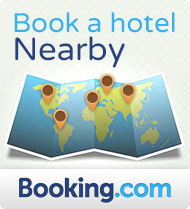 It was an extremely satisfactory experience which took less than 60 minutes. I always wanted to get teeth whitening done but wanted to go to the best dental clinic in Delhi for getting this treatment. 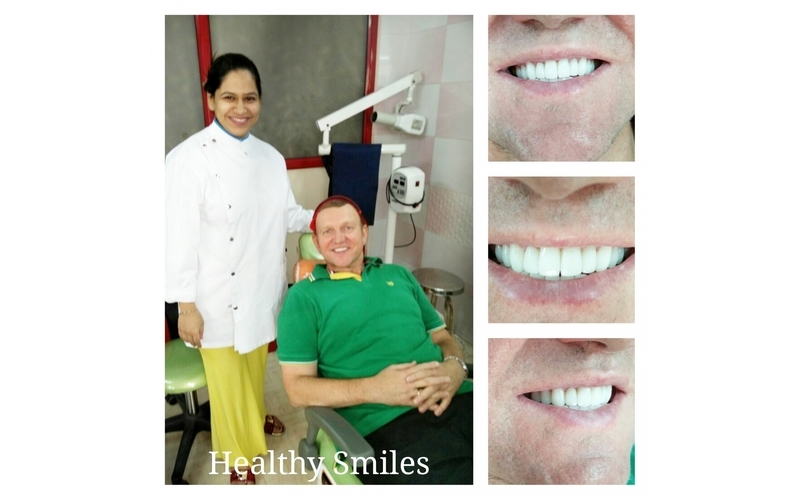 My friend recommended me to Dr. Mala and I am glad with the dental treatment. Now I feel more confident with my smile without the yellow stains on my teeth. 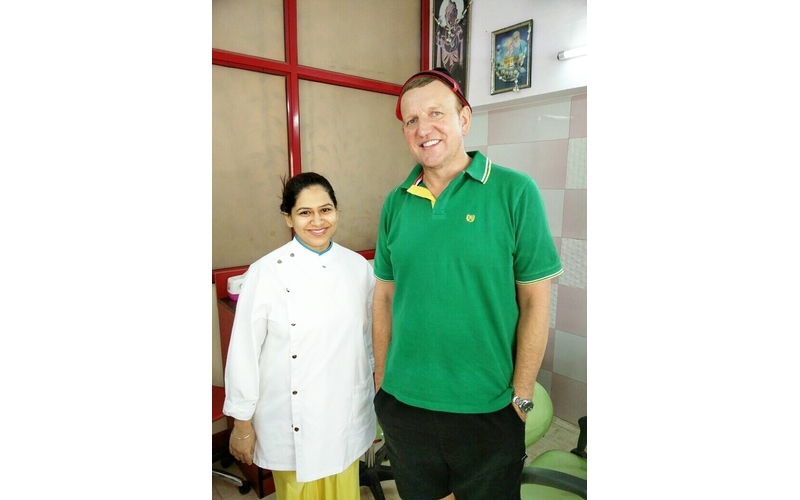 I would recommend Delhi’s best dentist, Dr. Mala, to all those who also have yellow stains due to eating a lot of junk food and get rid of those yellow stains on your teeth through teeth whitening dental treatment. Dr. Mala’s clinic is the Best Dental Clinic I have ever been too. I had visited at least 3 other dentists before I went to Dr. Mala with my dental problem. All the other dentists charged me heavily and failed to relieve me of the terrible tooth ache. Dr. Mala’s treatment plan was spot on and within 2 visits I was relieved of my pain which others couldn’t treat for almost 3 months. 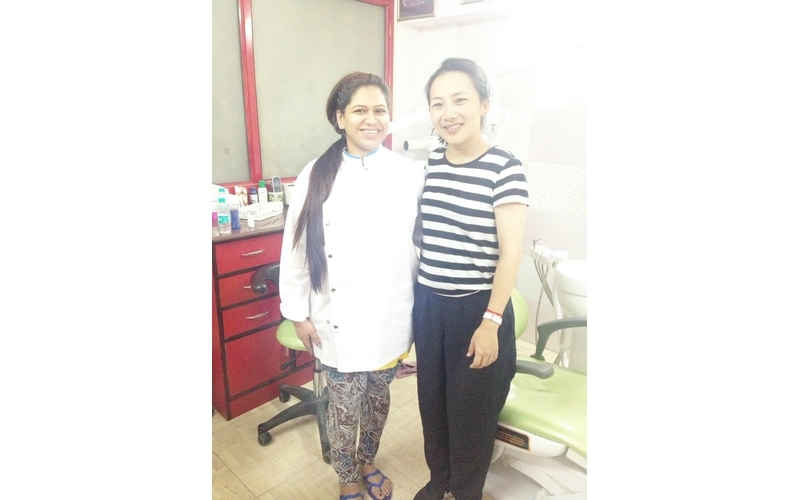 She is truly a skilled dentist and I am glad that I found the best dentist for me and my family. I continue to recommend Dr.Mala as the best dentist to all my relatives, friends and others too who are searching for a dentist who goes that extra mile to relieve the patients of their pain. 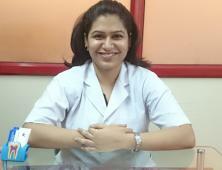 If you are looking for painless dental treatment in delhi, then Dr. Mala’s clinic is the place to go. Under the very professional care of Dr. Mala Makar, 2 root canal where performed, 2 beautiful zirconia crown were installed, 6 old fillings were replaced, and finally a total teeth cleaning was done. Everything went very smoothly, to the flexibility of the appointments to the duration of the procedures which were exceptionally painless. Last but none the less, the total bill was a fraction of what it would have been at home, in Canada, for no better treatment Dr. Makar deserves every five stars that I am giving her. 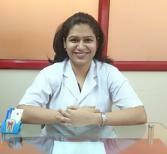 Dr. Mala Makar is the dental team head at Healthy Smilez Dental Care Centre. She has done her BDS from Government Dental College-MUMBAI, ranked amongst the top three best dental collages in India. With experience of over 10 years in the field of dentistry, Dr. Mala has an established and technologically advanced practice with special focus in cosmetic dentistry, dental Implants, full mouth reconstruction, dental crowns, dental bridges and Single Sitting Root canal therapy. 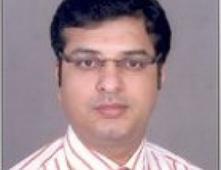 Dr. Jatin Kalra did his BDS from Maulana Azad Medical College, New Delhi in 1998. 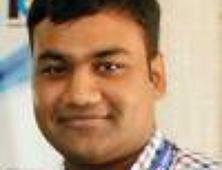 He earned his post graduate degree in field of Oral and Maxillofacial Surgery from Govt. Dental College and Hospital, Amritsar, in 2003 and later got his DNB in the same field in 2004. 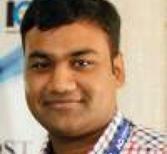 He has worked in various institutions of international repute like Lok Nayak Hospital, All India Institute of Medical Sciences, New Delhi and PGIMER, Chandigarh. He has been extensively trained in carrying out various maxillofacial surgery procedures under both local and general anesthesia. He is routinely carrying procedures like tooth impactions, cyst enucleation, dental implants, management of maxillofacial trauma and infections, TNJ ankylosis, orthognathic surgeries, cleft lip and palate, as well as management of maxillofacial tumors. Dr. Pratik Aggrawal is an Orthodontist and has an experience of 7 years in this field. 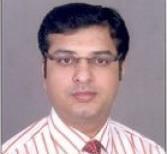 He is a member of Indian Dental Association and Indian Orthodontic Society. Some of the services provided by the doctor are: Dentofacial Orthopedics, Aesthetic Dentistry, Braces, Implantology and Extractions etc. Delhi is the best place to experience collective history, charming culture, delicious food, spirituality, and a compelling atmosphere. 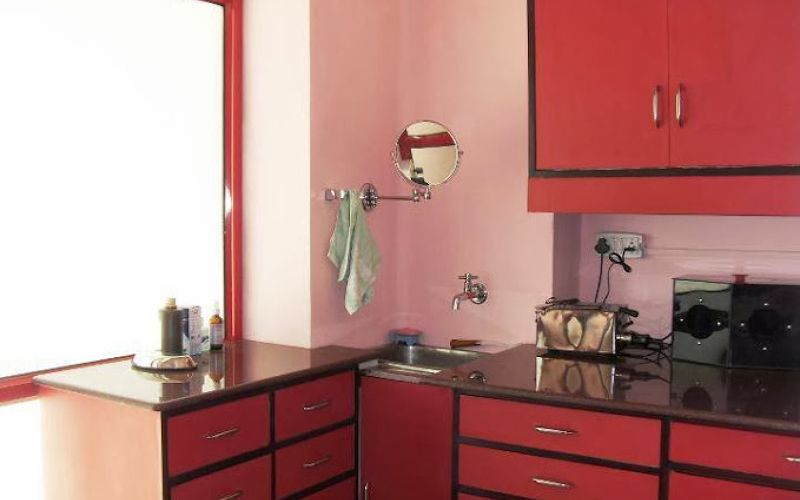 Old Delhi's Mughul glory, Central Delhi's European grandeur, West Delhi's Punjabi opulence, and South Delhi's bars, boutiques, and massive houses—all provide ample opportunity to explore India in fashion. Delhi is a melting pot of cultures and flavors — ranging from the classic regional dishes of India to the ritual tastes of New Delhi flavor. Chaina Ram is the best place in Delhi to taste every type of traditional Indian sweet-meat you can imagine. 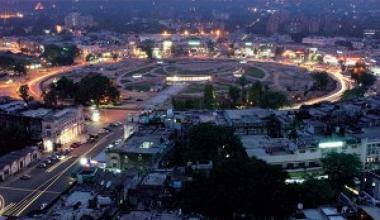 Explore your options at the Oberoi Hotels and Resorts in New Delhi. The family-run company has 30 properties, mostly within the country but also in locations like Bali, Mauritius and Dubai. These replicas of historical buildings and palaces, all in India, include Udaivilas in Udaipur, Rajvilas in Jaipur, Amarvilas in Agra and Vanyavilas, have a treat for every budget and style.